I have a leash aggressive dog, so this topic hits close to home. That’s not to say the same doesn’t hold true for everything I write about, but figuring out how to stop leash aggression so we can all enjoy our walks, definitely had its’ challenges. Let’s back up a little bit, and look a bit closer at what’s going on with your own leash aggressive dog. Has your dog always been great on a leash, but as he’s getting older he’s becoming aggressive? Have you recently adopted a dog with a past that is unknown, and you’ve noticed this aggression when out on a walk? Your dog is experiencing vision and/or hearing loss or impairment, and he’s now feeling anxious or insecure when outside, particularly when approaching other dogs or people. Canine cognitive disorder (doggie dementia) causes confusion, so he’s becoming aggressive from stress or anxiety at not recognising familiar places. Pain can definitely cause a dog to act out, and if he has arthritis for example, walks can be painful. A dog that has not been trained to walk nicely on a leash or been socialised, has no idea what to do or what to expect. The fear he may feel can manifest itself as aggression. Does anything resonate so far? Whenever you’re dealing with changes in behaviour, my usual recommendation applies. Get down to your wonderfully helpful vet for a health check, just to rule out any physical causes for this aggression. If your vet has discovered a cause – perhaps your dog has some arthritis or just isn’t feeling well. Once a treatment plan is in place and your pup starts feeling better, the behaviour should change. If the reason is due to something like vision or hearing loss, or another health condition that may be challenging to treat, the desensitisation training I will be discussing shortly may not be the best thing to do in that case. Don’t get me wrong. I adopt senior and special needs dogs, so I don’t believe vision issues, loss of hearing or dementia means they can’t have a great quality of life, with walks and interactions. I am saying that each dog is different, so it may be kinder, in some cases, to take a different approach. For example, one of my neighbours had a German Shepherd named Sasha. She was mostly blind, deaf and was also dealing with arthritis. Being outside with people and other dogs around made her really nervous, and she would bark constantly. In this case nothing could be gained by the training, or putting her in situations that scared her. The kindest thing was what her dad would do – walk her close to home when the streets were quiet. If he did see someone approaching he would turn around and carry on. Sasha did much better, and was able to enjoy her outings. How can a walker unintentionally create leash aggression? One day a dog may be a bit “aggressive” on a walk, for any number of reasons. When this happens, the walker will instinctively tighten up on the leash to hold the dog back. Makes sense right? 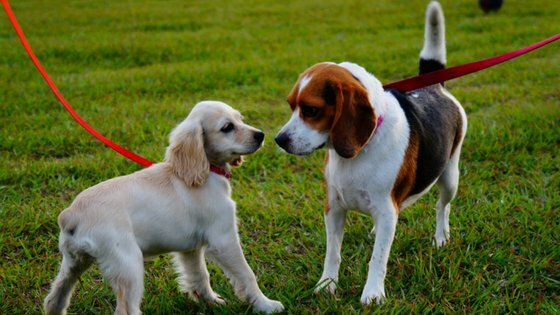 This creates 2 problems – 1) the walker becomes on edge each time they’re out, transferring that tension to the dog and teaching him there is something to fear and 2) tightening up on the leash is what you do in attack training – meaning they’re unintentionally training the dog to attack. Off leash dogs in a park tend to approach each other in an arc, not head on. They sniff, then decide whether to hang out or move on. That’s in real contrast to dogs out for a walk on a leash who approach each other head on, looking at each other, not being able to turn their bodies, all of which in doggie language is threatening. This is intensified when the walkers stop to chat, keeping the dogs in this state longer and longer. As the dogs strain against their leashes, guardians are tightening their grips to hold them back, adding to the problem by confirming for the dogs there is a reason to feel threatened. We’re tense, they’re tense and the cycle continues. Never punish your dog for this behaviour. Punishment is not training. It’s important you teach your dog to pay attention to you, so when you’re home and it’s quiet call his name in a calm voice. When he looks at you, reward him. Try it in increasingly busy areas, as that’s the challenge. 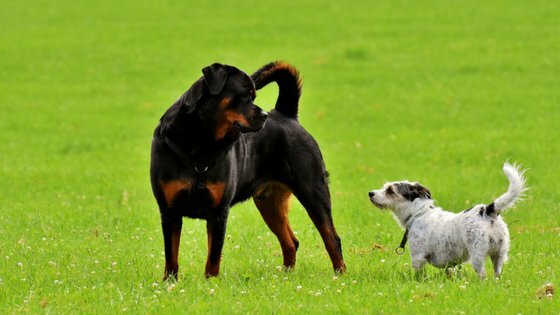 Pay attention to your dog’s body language, noticing what changes occur when he starts to get aggressive. If you intervene at the hint of a first sign, you’ll have better luck preventing full out aggression, and getting him to respond to your commands. If your dog goes full out aggressive he won’t listen to you, so forget it. Keep walking and remove him from the situation as quickly as possible. Your own state is equally important. Don’t hold your breath or have rigid posture – be casual, be cool. If you find that difficult, put your headphones on and listen to calming music. Always keep the leash loose, no tension, but keep a firm grip on the handle. Play with him for a few minutes before your walk, perhaps a game of fetch in the backyard. A tired dog may be less reactive. If you have a small dog that can easily be picked up, cover his face so he doesn’t see approaching dogs. Don’t do this as a matter of course, just if you don’t feel in control of the situation. Cross the road, or turn around. If a dog is approaching head on try and make a large arc around him. That may be enough to prevent an episode. If he did well and didn’t react, be sure to reward him right away. Stick to the quieter areas, where encountering others is less likely. Change your dog walking times to when you know there’s fewer chances of meeting too many dogs and/or people. 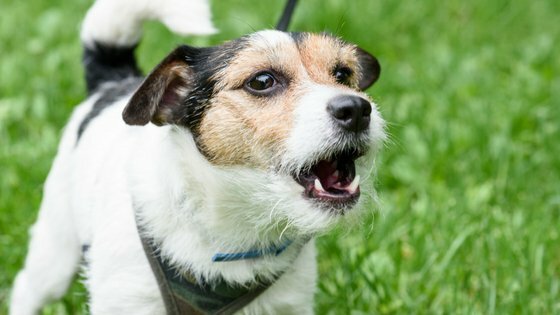 These avoidance techniques are a solution in terms of decreasing the chances of your dog getting into a situation which will cause him to be leash aggressive. Of course this won’t help him learn to deal with it. You will also be denying a social creature the opportunity to interact with people and others of his kind, which really isn’t fair. The training I mention below will help, but it takes practice to get the “timing” right. When we first adopted Jack, I was guilty of using avoidance on occasion when I didn’t feel confident or ready. There’s nothing wrong with that, as long as you do it only sometimes. There is a difference between avoidance and choosing to minimise the chance of too many interactions at once, particularly if you live in a busy area and it’s constant bombardment for your dog. Finding a time where there are fewer people and dogs about can help with the training. The best way to help is by teaching him great things happen when he meets other dogs and people. It’s about creating positive associations – he sees something he’s been afraid of, and now he gets something delicious. Use his favourite treats, but keep an eye on his weight, as this training can take some time! Think about your own personal space. There is a distance at which you’re fine, but as a person gets closer and closer and invades that space you may start to feel uncomfortable, anxious, or just plain annoyed. The same can hold true for your dog. He has a range within which he is fine with people and other dogs, but closer and you start to see or hear a change. Does he become more alert? Seem to stand taller? Stop? Can you hear a low growl starting? For practice, recruit someone you know with a very calm dog. Face each other with your dogs from quite a distance both in front and to your side, then slowly walk towards each other. When you’ve gotten closer to each other, but your dog is still in his “safe” zone, ask him to sit, look at you, and start giving him treats one after the other. You want him focused on you the entire time. Once your friend and dog have passed, stop the treats and keep walking. That’s it!! You’ll keep doing this until your dog is comfortable at closer and closer distances, and you’ll do the same thing when you’re out on your walks. Don’t worry, I didn’t either!! Walk your dog in as quiet an area as you can, or a quiet time of day. Having one or two dogs and/or people pass is easier to manage than being bombarded all at once. As a change of pace you can, at times, sit on a bench in a quiet area with your dog and when someone approaches start feeding him the treats until they’ve passed. You’ll want to invest in a treat pouch for quick and easy access!! It would be nice if we could control what happens on our walks wouldn’t it? Set up a perfect training environment every time we step out of the house! Believe me, I wished the very same thing! When you kindly ask a person to ignore your dog and not approach him because he’s nervous…they actually respect what you’re saying and listen!! This is all new to you and there’s a learning curve for everyone, so please do not be hard on yourself. You’re going to do great!! If you’re feeling unsure, or someone comes up suddenly, stay calm, change directions and keep going. It takes practice to get the timing right, so don’t panic. What happens if it’s not working? The thing is, it’s impossible to put a deadline on how long it will take. Every dog has a different story, and each learns at their own pace. In my case it took a good few weeks to see progress. If you’re having trouble with the technique, or you’re not seeing any improvement, a trainer will help. Does this mean he’ll be perfectly behaved on our walks now? 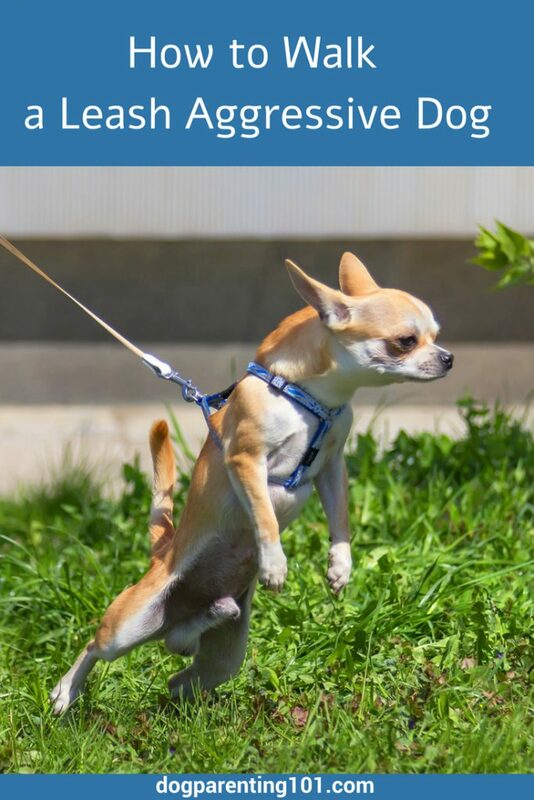 It is possible your dog will always have some leash issues, but don’t be discouraged. Jack is 1000 times better than he was, but I’m still always alert on our walks. There are cues I use to help calm him, and with time and practice you’ll find the words that work best for your dog. For me a big problem is always people who insist on trying to bend down and pet him, because he’s so darn cute!! I ask them nicely to ignore him as he’s nervous due to being mistreated. Most respect my word, but you’ll always have some that don’t, so just keep on walking. While they won’t help with your part in the training, what these items are designed to do is give a “heads up” to others so they know what your dog is like. They are definitely not the only answer, but as far as I’m concerned, anything we can do to help is worth doing. I imagine you’re feeling worried or even overwhelmed by what you’ve just read, and I know how you feel. When I first started this I was so nervous, and believe me it took a while until I gained my confidence and figured out the best way to help Jack. Take as long as you need to re-read this until it makes sense, but don’t put off making a start because you’re nervous. I’ve been there too! Desensitisation does work, and even if your dog still has his “moments” you will find them so much easier to manage. Great post! One of my little ones has fear issues and is reactive in certain situations. I still make a point to walk him daily and to do everything I can so that we can enjoy our time outside together. For awhile, right after the reactivity started, I would get so stressed about walking him. I realized that my stress and fear was making my pup worse, so I worked hard to resolve my own issues and since then we’ve been able to make great progress together! Thank you Michelle. Well done for walking him every day, and I’m sure he’s enjoying getting out and about. I used to get stressed as well, and although I of course walked him a few times a day, I almost dreaded each outing. Jack was so bad he would try and get to someone on the other side of the street that was so far away I swear I could barely see them. You’re right about resolving your issues, as I had to do as well, and I’m glad you’re seeing such progress. Several people in my neighborhood could benefit from this post. I’m definitely sharing this great info on social media because it can help a lot of people. Thanks so much, I hope it does help. Let me guess, they probably also use a flexi leash!! A good post with a lot of good sense and solutions. These lond of dogs drive me mad so its great to have a helpful post I can share. Thanks Marjorie. It’s sad when people prefer to avoid a walk than helping their dog become comfortable. I have to be alert on every walk with Jack, particularly because he’s so cute and everyone wants to pet him, but the more he walks the better he feels and the more used to people, dogs and environments he becomes. I never owned a dog however had no idea that aggression on the leash could be tied to physical health issues. I wouldn’t have anticipated that. These are all great tips and points you made to help dog parents keep their pups comfortable and trained to be calmer in public while on the leash. I had cats for many years before I ever had a dog, and I can tell you they were easier in many ways. Except when they would hide and you’d be frantically searching for them from room to room, terrified they got out…but I digress! Leash issues are almost always the parents not training their dog how to walk nicely, but sometimes there can be a physical reason. Excellent training tips, Hindy. With my oldest senior Husky now completely deaf, the harness with “Deaf” is such a great idea. While I now keep her public walks to a minimum to keep her stress down (she has also had several seizures), Thankfully, we have a lovely large yard she knows so well and is very comfy in, but I am definitely going to look into getting a harness with that on it for the times we do go out in public.Pinning this to share as well! Thanks Dorothy. I think those harnesses and vests are great ideas, and surprisingly in my smallish town I’ve started seeing quite a few. 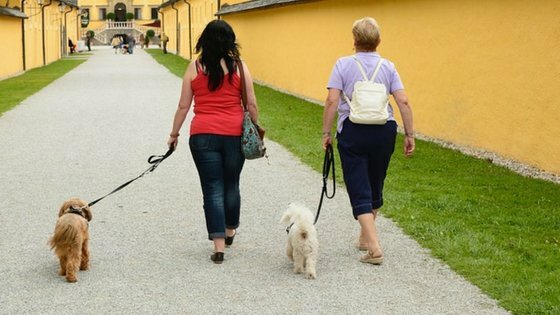 It may help keep people at a distance, and enable your dog to take more walks in public. I’m definitely looking into the “nervous” harness for Jack, I’m tired of explaining myself to everyone all the time! Let me know if it makes a difference. My dog Theo is reactive, and it can be a challenge to go for walks. Thanks for the tips! It definitely makes walking more challenging, and even stressful, but I think it’s encouraging knowing there are ways to help.